Solano County comprises the Vallejo–Fairfield, CA Metropolitan Statistical Area, which is also included in the San Jose– San Francisco– Oakland, CA Combined Statistical Area. 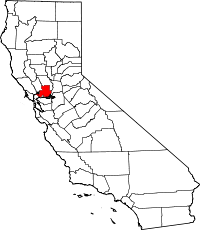 Solano County is the northeastern county in the nine-county San Francisco Bay Area region. A portion of the South Campus at the University of California, Davis is in Solano County. Solano County was one of the original counties of California, created in 1850 at the time of statehood. At the request of General Mariano Guadalupe Vallejo, the county was named for Chief Solano of the Suisun people, a Native American tribe of the region and Vallejo's close ally. Chief Solano at one time led the tribes between the Petaluma River and the Sacramento River. The chief was also called Sem-Yeto, which signifies "brave or fierce hand." The Chief was given the Spanish name Francisco Solano during baptism at the Catholic Mission, and is named after the Spanish Franciscan missionary, Father Francisco Solano. "Solano" is a common surname in the north of Spain, especially in Navarra, Zaragoza and La Rioja. Travis Air Force Base is located just east of Fairfield. Solano County is the easternmost county of the North Bay. As such, it is sometimes reported by news agencies as being in the East Bay. Additionally, a portion of the county extends into the Sacramento Valley, geographically. Solano County has several inactive cinnabar mines including the Hastings Mine and St. John's Mine,  both of which are subject to ongoing mercury monitoring. These mines were worked in the first half of the twentieth century. Solano County has a number of rare and endangered species including the beetle Elaphrus viridis, the wildflower Lasthenia conjugens, commonly known as Contra Costa goldfields and the annual plant Legenere limosa or False Venus' looking glass. Each agency interconnects with each other, enabling transit trips throughout the county. Service also connects with BART stations in Contra Costa County. Transit links are provided to Napa, Yolo and Sacramento counties as well. Greyhound and Amtrak provide long-distance intercity service. General aviation airports in Solano County which are open to the public are the Nut Tree Airport and Rio Vista Municipal Airport. The 2010 United States Census reported that Solano County had a population of 413,344. The racial makeup of Solano County was 210,751 (51.0%) White, 60,750 (14.7%) African American, 3,212 (0.8%) Native American, 60,473 (14.6%) Asian, 3,564 (0.9%) Pacific Islander, 43,236 (10.5%) from other races, and 31,358 (7.6%) from two or more races. Hispanic or Latino of any race were 99,356 persons (24.0%). At 52,641 Filipinos in the County making up 12% of the population, Solano County has the largest percentage Filipino population of any County in all of the United States. As of the census  of 2000, there were 394,542 people, 130,403 households, and 97,411 families residing in the county. The population density was 476 people per square mile (184/km²). There were 134,513 housing units at an average density of 162 per square mile (63/km²). The racial makeup of the county was 56.4% White, 14.9% Black or African American, 0.8% Native American, 12.8% Asian, 0.8% Pacific Islander, 8.0% from other races, and 6.4% from two or more races. 17.64% of the population were Hispanic or Latino of any race. 8.5% were of German, 6.4% Irish and 6.0% English ancestry according to Census 2000. 75.7% spoke English, 12.1% Spanish and 6.6% Tagalog as their first language. There were 130,403 households out of which 39.9% had children under the age of 18 living with them, 55.7% were married couples living together, 13.8% had a female householder with no husband present, and 25.3% were non-families. 19.6% of all households were made up of individuals and 6.5% had someone living alone who was 65 years of age or older. The average household size was 2.90 and the average family size was 3.33. In the county, the population was spread out with 28.3% under the age of 18, 9.2% from 18 to 24, 31.3% from 25 to 44, 21.7% from 45 to 64, and 9.5% who were 65 years of age or older. The median age was 34 years. For every 100 females there were 101.5 males. For every 100 females age 18 and over, there were 100.2 males. The median income for a household in the county was $54,099, and the median income for a family was $60,597. Males had a median income of $41,787 versus $31,916 for females. The per capita income for the county was $21,731. About 6.1% of families and 8.3% of the population were below the poverty line, including 10.3% of those under age 18 and 6.3% of those age 65 or over. The Government of Solano County is defined and authorized under the California Constitution and law as a general law county. The County government provides countywide services such as elections and voter registration, law enforcement, jails, vital records, property records, tax collection, public health, and social services. In addition the County serves as the local government for all unincorporated areas. Since 1932, Solano County has been a Democratic stronghold in presidential and congressional elections, with Californians Richard Nixon in 1972 and Ronald Reagan in 1980 and 1984 being the only Republicans to win the county since. According to the California Secretary of State, as of October 22, 2012, Solano County has 209,484 registered voters, out of 274,284 eligible (76.4%). Of those, 101,815 (48.6%) are registered Democrats, 52,777 (25.2%) are registered Republicans, and 45,581 (21.8%) have declined to state a political party. Democrats hold voter-registration advantages in all incorporated cities and towns in Solano County. However, Republicans lead in registration in the unincorporated communities of the county (40%-35%), making Solano the only county in the Bay Area where Republicans out-number Democrats in unincorporated communities. The Democrats' largest registration advantage in Solano is in the city of Vallejo, wherein there are only 8,242 Republicans (14.6%) out of 56,313 total voters compared to 33,753 Democrats (59.9%) and 12,157 voters who have declined to state a political party (21.6%). In 1985 Humphrey the humpback whale strayed off his migration route and ended up in Shag Slough north of Rio Vista. Rescuers from The Marine Mammal Center and other volunteers dismantled a county bridge before being able to turn him around in the narrow slough. ^ This total comprised 3,353 votes for Progressive Theodore Roosevelt (who was official Republican nominee in California), 781 votes for Socialist Eugene V. Debs and 169 votes for Prohibition Party nominee Eugene W. Chafin. ^ "Mount Vaca". Peakbagger.com. Retrieved April 8, 2015. ^ a b Landis, John D.; Reilly, Michael (2003). "How We Will Grow: Baseline Projections of California's Urban Footprint Through the Year 2011". In Guhathakurta, Subhrajit (ed.). Integrated Land Use and Environmental Models: A Survey of Current Applications and Research. Springer. p. 84. ISBN 9783540005766. Retrieved 14 March 2012. ^ Alston, John (18 April 2008). "Solano County's unemployment rate soars to 6.4 percent". abc7news.com. Retrieved 14 March 2012. ^ Walters, Dan (29 March 1986). "East Bay is a Socioeconomic Dichotomy". Lodi News-Sentinel. p. 12. Retrieved 14 March 2012. ^ "Bay Area median home price falls below $500,000". San Francisco Business Times. 17 July 2008. Retrieved 14 March 2012. ^ Hogan, C. Michael; Papineau, Marc (September 1989). "Environmental Assessment of the Columbus Parkway Widening between Ascot Parkway and the Northgate Development, Vallejo". Earth Metrics Inc. Report 7853. California State Clearinghouse. ^ Narula, Svati Kirsten (April 29, 2014). "The 5 U.S. Counties Where Racial Diversity Is Highest—and Lowest". The Atlantic. Retrieved 2017-05-08. ^ a b c d e f g h i j k l m n o p q California Secretary of State. February 10, 2013 - Report of Registration Archived November 3, 2013, at the Wayback Machine. Retrieved 2013-10-31. ^ Leip, David. "Dave Leip's Atlas of U.S. Presidential Elections". uselectionatlas.org. Retrieved 2018-09-05. ^ "Statewide Database". UC Regents. Retrieved December 4, 2014. ^ Leip, David. "Dave Leip's Atlas of U.S. Presidential Elections". www.uselectionatlas.org. Retrieved 2 October 2016. ^ "2010 Census". www.census.gov. Retrieved 2 October 2016. Wikimedia Commons has media related to Solano County, California.